Some people get tennis elbow, but many dog walkers suffer from sore-leash arm. One of the most frequent reasons dog owners contact me is because their dogs haven’t mastered walking calmly on a leash. What are some of the most common reasons for a dog pulling on his leash? As with most supposed canine learning failures, we have to look first at the other end of the leash — at you, the dog owner, with your larger brain and thumbs. 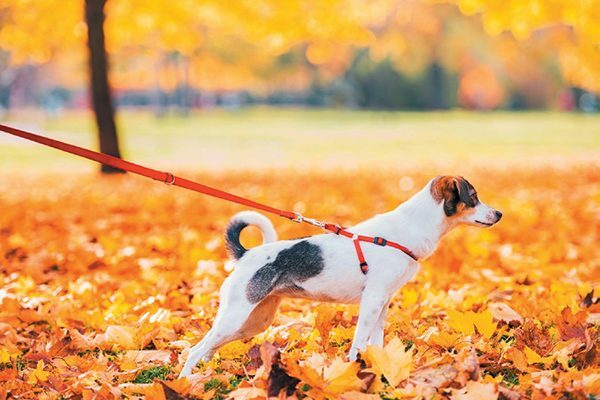 A dog pulling on his leash on a fall walk. Photography by Alliance | Alamy Stock Photo. Most owners say the purpose of walking their dog is for exercise — for both the dog and themselves. It’s certainly true that your dog needs daily exercise. However, your dog has something powerful that he takes with him everywhere he goes that makes a walk mean something entirely different to him: his nose. The difference in what you can smell and what your dog can smell is incredible: Dogs have 220 million olfactory receptors in the nose compared to your puny 5 million. If we could see what dogs smell we might never leave the house — it could be overwhelming. I see walking the dog as an excellent way to get your dog (and you) moving, but a dog cares more about “pee-mails” and other scents that come at him like an invisible tidal wave. So imagine what poor Fido is suffering when you yank him away from some strong odor that isn’t even on our radar because we lack nose skills. We have, in effect, ruined the walk for the dog. Here’s how I negotiate walks with my two active Border Collies: For the first 10 to 20 minutes of the walk, I let them follow their noses, and I follow them. They don’t jerk me to interesting scents, and your dog might very well stop doing that if you simply allow him time on a walk to satisfy his nose. Should your dog jerk you toward a delicious-smelling find, stop in your tracks, say your dog’s name once or twice and wait. The second your dog turns his head away from the enticing smell and looks at you, mark it with a “Yes!” and take him immediately to that smell. In effect, he learns to look back at you to get permission to check out the scent. He learns that you’re the gatekeeper to all things of delicious odor and he then becomes more in tune with you and you with him. After the 10-to-20-minute period of happy, happy, joy, joy sniffing, I announce to the dogs a cue they understand: “Let’s walk.” We walk for as long as I choose with little to no sniffing. At the end of the walk, I wind down with another 10 minutes of sniffing time for them. We’re all pleased with a walk well-done. Step 1. in creating a win-win walk is to teach your four-legged friend that he’ll have time to satisfy his nose, as you will agree to slow down and let him smell the roses, the wildlife and all the pee-mails. Step 2. is creating a cue for your dog to understand that sniffing time is over for a little bit and exercising time has begun. Start saying that cue and, if you can safely walk on concrete (I am often in the middle of the street walking in our small, sleepy town) or pavement, choose that and give your cue. Step 3. is to also teach your dog that pulling doesn’t get him what he wants. I teach dogs to walk nicely on leash using incredible food reinforcers (meat or cheese) at first. I show the dog the treat and toss it a few feet behind me as I slowly move forward. The dog goes behind me to get the treat and, as he catches up, he is looking at my face to inquire: “You got any more of that stuff? Because I LOVE IT!” I mark the eye-to-eye contact with a happy “Yes!” and toss another treat behind me. I carry on this way for a few blocks, and the dog has not once gotten ahead of me. It’s hard for your dog to pull you forward if he’s behind you or happily right beside you. You can put a cue on his behavior when he is trotted at your side, such as a “Heel” or “With me.” It’s a fantastic skill to have on cue. Walking in a strict heel for long distances, however, is boring for both species. It’s time for humans to rethink the walk for Fido. We can all use moments to slow down and smell the flowers. Give it a try — Fido will thank you. Tell us: Is your dog pulling on his leash? What works to get him to stop? Hey, You! Walking the Dog! Get Off Your Smartphone! The post Is Your Dog Pulling on His Leash? How to Get Him to Stop appeared first on Dogster.